Hi everyone! 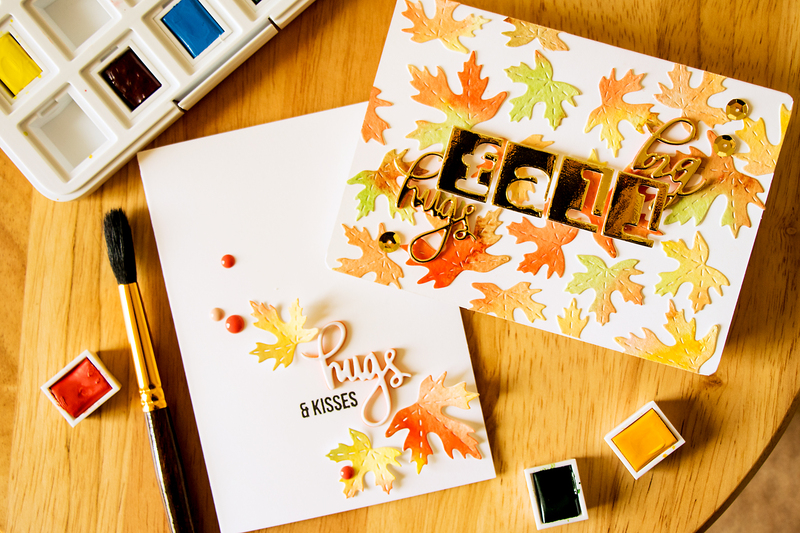 I have a few super simple Fall cards to share today! 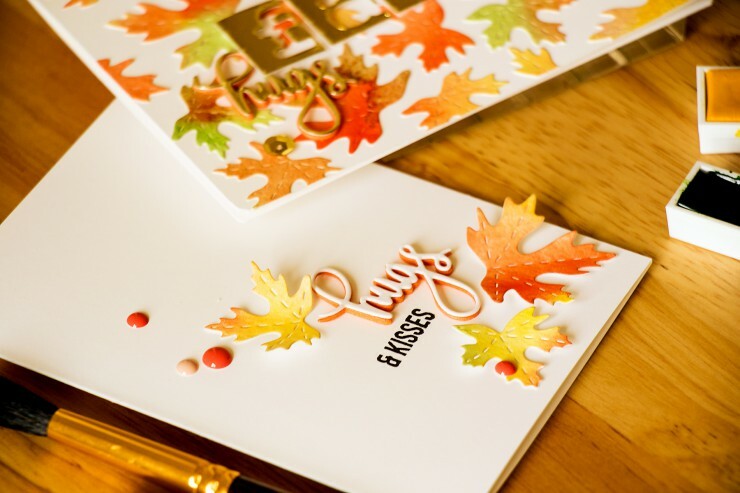 Both are using new STAMPtember(R) products from Simon Says Stamp. Watercolor seems to be making a comeback and it works beautifully for warm autumn cards. I added yellow, orange, green and brown colors from the Van Gogh 12 Pan Watercolor Pocket Box onto a sheet of watercolor paper to create a soft watercolor background. I find it much easier to create one large background and cut it into smaller pieces rather than watercoloring a bunch of smaller individual elements. 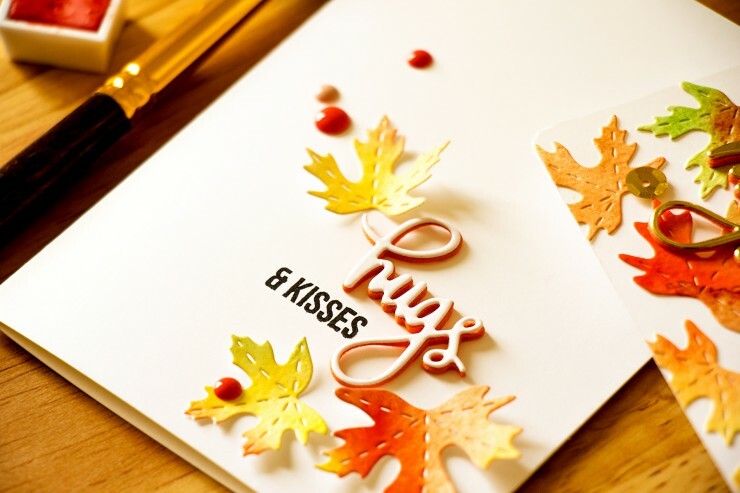 I die cut several leaves out using the Stitched Maple Trio dies. I love how the stitching is added in place of the leaf vines, it makes those elements truly unique. To finish this card I also die cut a Hugs word from the Scripty Big Hugs set out of white cardstock and orange fun foam and adhered those together for a fun dimensional die cut. I stamped a simple “& Kisses” in black and added a few enamel dots. 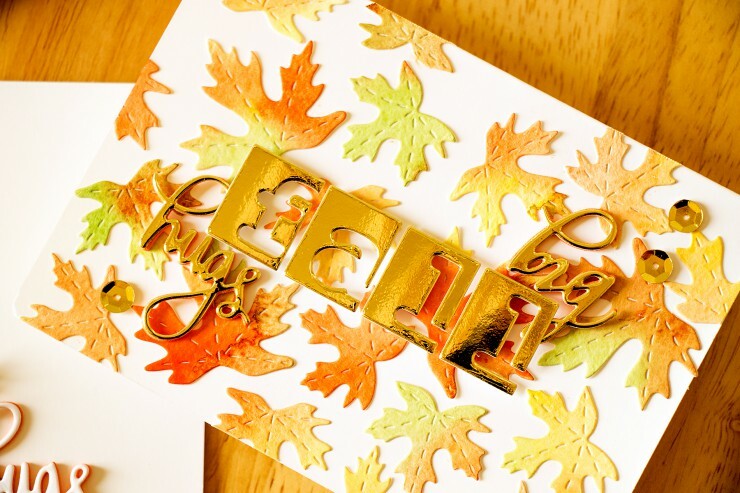 For my next project I used the remainder of the my watercolored sheet and die cut more leaves. I used those to fill an entire background of my card. This time I adhered the leaves completely and did not add any dimension as I did on my above card. 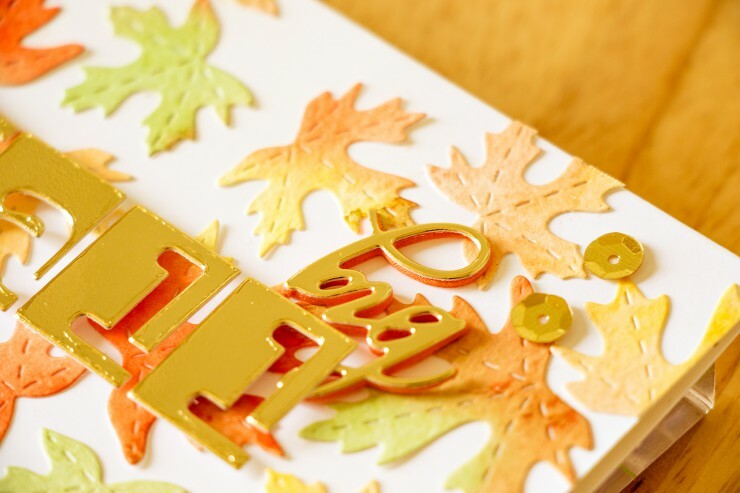 I used the Alphabet Block dies and die cut Fall out of gold mirror cardstock. To complete the sentiment for this card I die cut Scripty Big Hugs out of the same cardstock and also used the same orange fun foam for some dimension. This post was updated on June 17th 2016. Beautiful cards. Love the idea to use colored fun foam underneath your die cut word. I will use that idea of yours. Just wanna add…..isn’t God a great artist to give us those autumnal colors to view each year? I completely agree, Connie! Thanks! Your cards are just beautiful Yana! I love how you did the word “hugs” with the dark colour stacked and the light on the top. Very pretty. I love fall! The smells, the cool crisp air, the changing of the leaves and the pretty color palette… everything about fall makes me happy! And your cards are just perfect! I LOVE that you used an entire bunch of leaves to cover the front of your card with. I really like that! It’s like a homemade patterned paper with texture! I also like how it looks like you used the negative from the word “Fall” for your title and comparing it with the die and foam. AND on that first card, I really love the softness it gives. It almost feels like tranquility just by looking at it and appreciating the beauty of it. You did a really good job keeping this card simple and yet so beautiful. Great job! Come visit me at www dot jwscrapshack dot BlogSpot dot com! thank you so much! I too love fall! I used to collect fall leaves and make wreath when I was a kid! These are beautiful. I’m reaching for my leaf dies now. thank you so much, Christine! hugs!